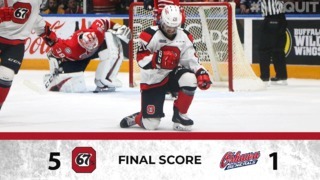 For the 17th-straight game, the Ottawa 67’s picked up at least a point on Thursday, this time a single in a 3-2 overtime loss to the Sudbury Wolves. Tye Felhaber and Lucas Peric lit the lamp for the Barber Poles, while Nolan Hutcheson scored twice for Sudbury in regulation. 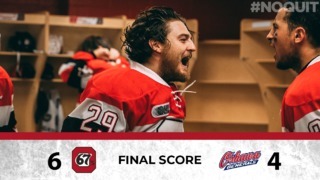 David Levin put an end to the game with 1:05 left in overtime with a precise shot over 67’s goaltender Will Cranley, who was making his first start since returning from the World under-17 Challenge. Hutcheson got things going early in the first, scoring an unassisted goal only 1:47 into the game. Felhaber evened things up halfway through the opening period on the power play, with his league-leading 22nd goal of the season. The Wolves got on the board once again early in the second period thanks to another goal coming from Hutcheson. Ottawa tied things up when Peric scored his second of the year with about five minutes left in the second. Heading into the third with the game tied at two, the final twenty minutes was scoreless, sending the game to overtime for a second time in as many meeting between these two sides this season. Still sitting atop the OHL overall standings, the Barber Poles have not lost a game in regulation time since October 3rd in North Bay. Ottawa will be back in action Friday night in Sault Ste. Marie, as they will be taking on the Greyhounds in the second game of this weekend road trip, with puck drop set for at 7:07 PM. 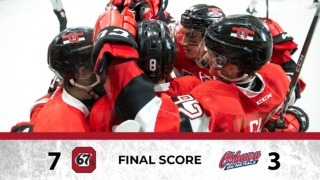 The 67’s close out the weekend with stop in North Bay to face the Battalion on Sunday afternoon.